Have you ever gone out of town and needed somewhere for your pet to stay? A boarding kennel is an ideal location as it provides a safe environment as well as the interaction with other pets and people. You can also take your pet to a boarding kennel during the day if you don’t want to leave it at home while you work. These locations are also good for those who want their pets to be trained to listen to commands. 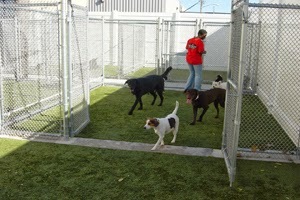 Many of the boarding kennels are more like hotels for animals like dogs and cats than they are kennels. There are accommodations like comfortable beds and pools so that your pet is in the best possible place while you are gone. Some facilities also have parlors where pets can get a good bath, their hair clipped or nails clipped and painted. Yards are usually fenced in so that the animals don’t get in the road. Quality dog food is given as well as plenty of water. There is room to play with toys and other animals in the facility. Staff members try to answer as many questions as possible so that pet owners feel safe leaving their animals at the facility. This website, as well as others, can answer many questions that you might have.